Federica Mogherini urges 'calm' after murder in Samaria, pushes for peace talks despite PA political echelon gloating over the attack. 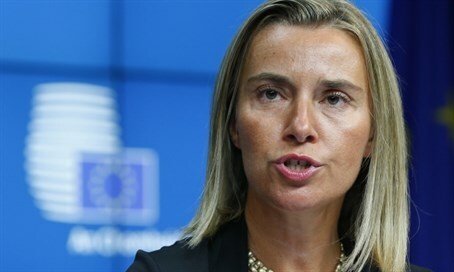 European Union (EU) High Representative for Foreign Affairs Federica Mogherini on Friday released a condolence statement over the horrific murders of Rabbi Eitam and Naama Henkin late Thursday night, but not without calling on both Israelis and Palestinian Arabs to impose "calm" despite the crime. "Today we mourn once again the loss of human lives," Mogherini said. "The killing of an Israeli couple has left four young children orphaned and, once again, civilians have been targeted so as to cause terrible suffering and to try to undermine any possibility of a political solution to the Israeli-Palestinian conflict." "The EU expresses its condolences to the Henkin family," she continued. "The perpetrators of this act must be brought to justice." Mogherini warned, however, that "restraint and calm" are needed despite the terror. "Even in the face of such a crime, restraint and calm are needed on all sides to ensure that the violence witnessed yesterday and in recent months does not aggravate the situation further," she said. "On the contrary, the continuing loss of life highlights once more the necessity for a political solution to the Israeli-Palestinian conflict." The EU has been a prime instigator in international pressure for Israel and the Palestinian Authority (PA) to renew peace talks and to establish a Palestinian state. The PA's own ruling Fatah party has claimed responsibility for Thursday's murder, with a senior Fatah official openly taking credit for the attack on the two Israeli civilians.